54 percent of Texans said they would consider their vote in the 2014 Congressional elections to be "a vote against President Obama and his policies"; 18 percent said it would be a vote in favor of the president and his policies, while 28 percent said the president and his policies would not be a factor in their vote. 32 percent either strongly or somewhat approved of the job Obama is doing as president, while 64 percent disapproved - 55 percent strongly. 49 percent favored repealing all of the Affordable Care Act. 54 percent said that illegal immigrants living in the U.S. "should be required to leave the U.S."
31 percent said global warming was "not a problem;" another 15 percent said it was "not very serious." 32 percent said it was very serious. Overall, these results, from respondents who say they will "definitely" or "probably" vote, are consistent with the attitudes we've seen in these areas in the last few years of the University of Texas/Texas Tribune Poll, as well as in other statewide polling. Overall, there seems to be little evidence of any change in the underlying attitudes of the electorate we would expect to see turn out for the 2014 election. 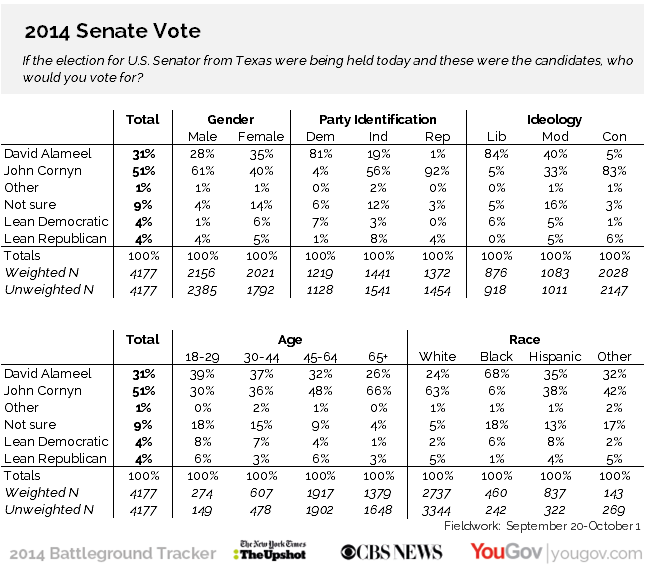 Below is a graphic with some tabs and demographic information for the Senate results and the Texas sample in the third wave of the NYT/CBS/YouGov poll in Texas.